The management team at AT&T just announced that it is selling its minority stake in Hulu back to the company. This move further cements Disney's control over the streaming service and will pay down some of AT&T's debt. However, this is a big mistake for the telecommunications company, which should be looking for strong growth opportunities, not divesting of them. This move will likely leave billions of dollars on the table and reduce the company's ability to negotiate terms with Hulu in the future. One great thing about large corporations like AT&T (T) is that they have significant resources with which to grow, and doors of opportunity often open for them. A downside, though, is that all too often those same companies, whether due to bureaucracy or shortsightedness or something else entirely, make suboptimal decisions that, while not necessarily impairing shareholder value, will lead to lackluster results in the long run. While I often try to talk about the upsides for firms, sometimes the downside needs to be discussed, and such is the case today with what is bothering me about a recent decision made by the management team at AT&T. One thing investors know all too well about AT&T is that the company does have a lot of debt. At the end of last year, total debt stood at $174.52 billion, compared to cash (including $196 million of which is restricted) of $5.40 billion. Management has made it a point to begin focusing some on debt reduction, but one of the last ways the firm should have considered doing so was by selling its stake in Hulu. You see, in a press release issued on April 15th, the management team at the company announced that it had struck a deal whereby it is selling off its 9.5% remaining ownership in Hulu back to itself. This move leaves The Walt Disney Company (DIS) having further cemented itself as the majority shareholder in the enterprise, and means that the only other partial owner today is Comcast (CMCSA). In exchange for its ownership in Hulu, AT&T will be paid cash totaling $1.43 billion. This effectively values the streaming service at approximately $15 billion. Selling a non-core asset in order to pay down some debt is generally great idea, especially when the non-core asset doesn’t really have an impact on the company today, will result in lower interest expense, and when the non-core asset is actually losing money at a nice clip. According to an investor presentation released earlier this month, Disney stated that Hulu, this year, should have operating losses of around $1.5 billion, making this the worst year for the company. That said, exceptions should be made when the non-core asset is growing rapidly and when there exists sufficient evidence to make the claim that the future for the asset will be bright. 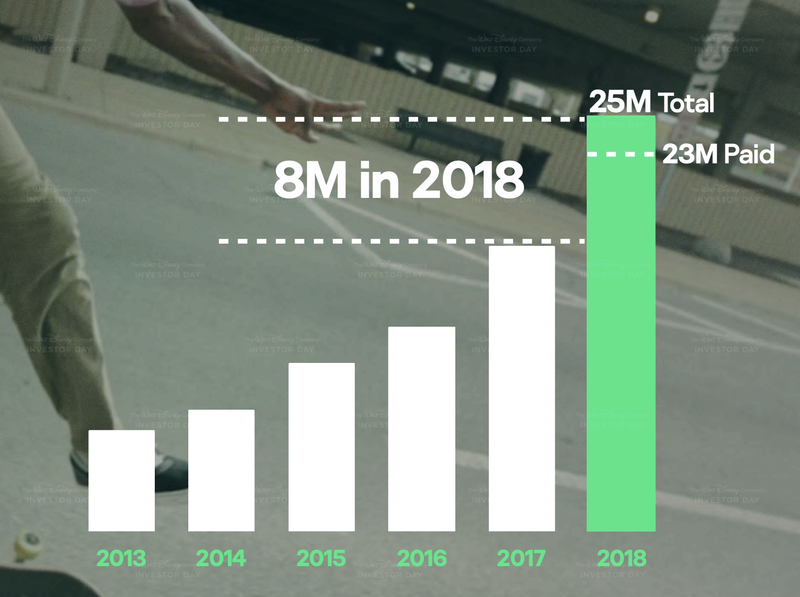 Already, between 2017 and 2018, Hulu boasted itself as being the fastest-growing video service in the United States, expanding by 8 million users over that year from 17 million to 25 million. That implies a growth rate of 47.1%. Fortunately, it sounds like the content provided on Hulu by AT&T, specifically its content through WarnerMedia, will remain on the platform, but I suspect that over time the absence of AT&T’s ownership will either lead Hulu to see more favorable terms in the future or will result in AT&T being less generous than it might have been as an owner. If all Hulu were was its current size of 25 million users, and if there were no sign of profitability in sight, the decision by AT&T to divest of its ownership of it would be a wise one indeed. That said, according to Disney, the digital video ad market will grow to be in excess of $50 billion per annum by 2022, and as Hulu’s user count expands, Disney thinks the firm’s bottom line will improve. This year’s forecasted operating loss of $1.5 billion should be the worst, with each additional year improving from here. By 2023 or 2024, the expectation is for the service to generate a profit, and by that point it will have between 40 million and 60 million subscribers every month. Disney, I believe, sees the writing on the wall, hence it is now trying to gain as much control over streaming services as it can. In addition to becoming a majority holder of Hulu, the company recently announced the launch of its Disney+ program, and it also owns and operates a similar service for ESPN called ESPN+ that has been available for several months now. In a prior article, I discussed in great detail Disney+ and the company’s expectations, as well as talked about ESPN+ briefly. In the case of Disney+, the expectations are higher than they are for Hulu, but that doesn’t mean Hulu doesn’t offer attractive upside. Today, the cost of Hulu stands at $5.99 per month, with an ad-free version available for $11.99 per month and a Hulu + Live TV version out there for $44.99 per month. No data has been made available regarding service mix among customers, but if we assume that weighted-average revenue comes out at $10 per month across all services, a few years from now that will translate to between $400 million and $600 million per month, or about $4.80 billion to $7.2 billion annually. In all, the service is being valued by the parties included in the deal at about $600 per subscriber. Whether that is too high or low is up for debate, but in the table below, I performed some estimates based on data available for Netflix (NFLX). Over the past three fiscal years (using today’s market value of $157.43 billion for 2018, while using year-end market values for 2017 and 2016), I calculated that Netflix has been priced at between $600 and $1,130 per subscriber. Applying the same methodology to Hulu with between 40 million and 60 million subscribers, we end up with a wide range of valuations of between $31 billion and $67.80 billion by 2024. AT&T’s 9.5% interest, at that point, should be worth between $2.28 billion and $6.44 billion. Even at the $600 per subscriber figure, we arrive at a valuation of between $24 billion and $36 billion, placing a worth on AT&T’s stake in the firm at that time between $2.28 billion and $3.42 billion. In my view, AT&T has just made a terrible mistake. The company is focusing on reducing debt, I know, and it wants to focus on its core businesses, but selling off a stake in a fast-growing enterprise at a time when a significant competitor (and in ways a strategic partner) like Disney is placing tremendous emphasis on that same enterprise is a recipe for complacency and falling behind. In the long run, I suspect this won’t have a negative impact on the company, but I do believe it will limit its upside and will be looked back upon as a meaningful blunder by management. Crude Value Insights offers you an investing service and community focused on oil and natural gas. We focus on cash flow and the companies that generate it, leading to value and growth prospects with real potential. Subscribers get to use a 50+ stock model account, in-depth cash flow analyses of E&P firms, and live chat discussion of the sector. Sign up today for your two-week free trial and get a new lease on oil & gas!